Cash displays his Gold Medal from the Paralympics. Two St. Louisans walked away winners last night from ESPN's annual ESPY Awards. The sports network named Cardinals first-baseman Albert Pujols the nation's "Best Baseball Player" and bestowed a similar praise to University of Missouri - St. Louis student Steve Cash, who ESPN named "Best Male Athlete with a Disability." Cash, a 21-year-old junior, won the award for his standout play as goalie for U.S. sled-hockey (a.k.a. "sledge hockey") team in last winter's Paralympic Winter Games in Vancouver. Cash didn't allow a single goal en route to a gold medal for the U.S. team. His scoreless run was a first in tournament history. Cash has worn a prosthesis since he was three years old when part of his right leg was amputated after he was diagnosed with cancer. 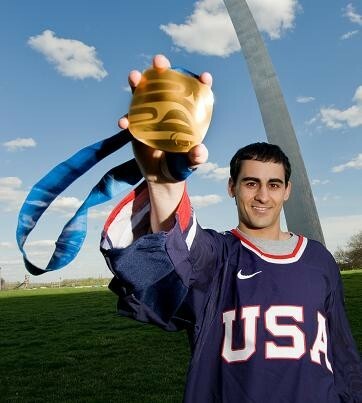 The Overland, Missouri, resident was just fifteen when he first earned a spot on the U.S. sled-hockey team and became a starter in 2007. Cash is majoring in business administration at UMSL and currently completing a summer internship in the public affairs department of The Dow Chemical Co. in Midland, Michigan. Read more about Cash and his sled-hockey accomplishments in the UMSL Magazine.